We ran into an old "friend" in Cheraw, SC. Horace King is the remarkable slave who became a master bridge builder, was freed by the Alabama Legislature and later supported his former owner's family. We learned of King during last year's road trip through Georgia (http://goodgirlsinthebadlands.blogspot.com/2013/09/back-to-albany-and-beyond-memorable.html). This year we discovered he learned his engineering skills in the 1820s while constructing a bridge across the Pee Dee River in Cheraw, SC, near where he had been born. Camp Welfare dates back to slavery when lenient owners would allow their slaves to gather for a camp meeting here once a year. It has developed into an annual reunion that attracts thousands of their descendents. The permanent living structures are referred to as "tents." The graveyard dates back to the 1700s. Timely. A quick, around the block stop in Winnsboro brought us next to the Town Clock. Built in 1833, it has been running ever since making it "the oldest continuously running town clock in America." Don't you just love finding another "est" - biggest, longest, oldest, etc. - for your experience bucket? Turkey talk. All domestic turkeys evolved from one semi-domestic breed of turkey that dated back about 4,000 years. The Spaniards found them with the Mayans and Aztecs and brought live specimens back where they readily adapted to the European farm system. The Puritans brought these domesticated turkeys with them to the New World where the Eastern wild turkey was already entrenched. Today, 99 percent of domestic turkeys are broad-breasted whites and are so big they can't get off the ground. Can't breed either, which must be done via artificial insemination, The largest domestic broad breasted white turkey weighed in at 95 pounds. Patriotic. So many young men from Union County, SC, volunteered during World War II that a draft was never needed. A Coke bottle and another one. Rosy canaries. We learned at Childress Vineyards in Lexington, NC, that rose bushes are the wine growers' canary in the coal mine. The roses are an indicator crop, showing any signs of distress before the vines can be endangered. In North Carolina, Our pal Carol Timblin opened her townhouse and guided us to the gold mine. PR pro Craig Distl and Robin Bivens, from Visit Lexington, organized the incomparable Swine, Wine and Dine Tour that introduced us to Lexington, a barbecue haven, and its attractions. Barbara Ware and Vicki Loughner set us up with great itinerary, lodging and food in the Old 906 District of South Carolina. Becky even became our chauffer, saving untold hours of our getting turned around, confused and otherwise lost. Kelly McWhorter of the Greenwood Regional Visitors and Tourism Bureau and Donna Livingston from Edgewood County Chamber of Commerce were also invaluable as were the staff at The Fairfield Inn & Suites, our home away from home. The indefatigable Jayne Scarborough was our chief of itinerary, schedules and driving once we arrived in South Carolina's Olde English District. Sonja Burris, communications manager for York County, and many, many others. The Marriott Courtyard in Rock Hill was the best kind of a home away from home, providing great, made-to-order breakfasts and welcome cocktails. All in all it was another memorable road trip of discovery for the Good Girls. Every year we become more convinced that wherever people have settled, however small, there are stories worth finding and exploring. The hardest part is deciding where to go next. Where do you suggest? Recommendations truly are appreciated. We ended our tour of South Carolina's Olde English District in Rock Hill at the city's 250-acre outdoor recreational center. 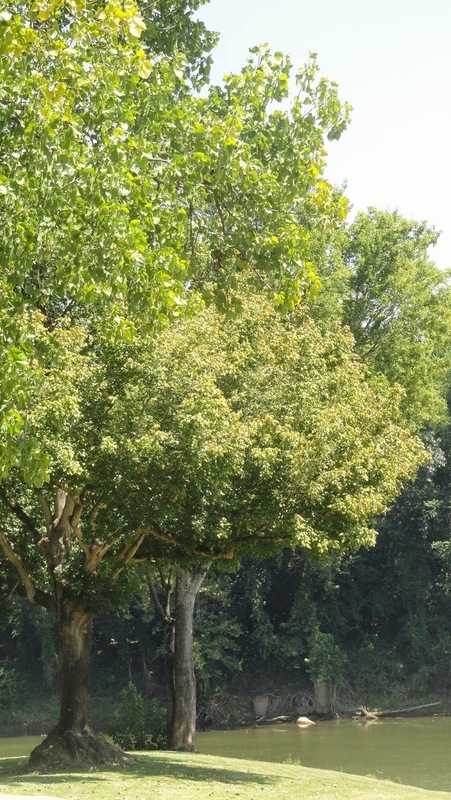 The area includes a new scenic Riverwalk for walkers and joggers along the Catawba River, mountain biking trails, a BMX/Supercross track, and velodrome. There is also canoe/kayak access to the Catawba River and open space. In my eyes, the Giordana Velodrome is the shining star. I felt I was walking into an Olympic Stadium. I would never have expected such an amazing world-class facility in a suburban area like Rock Hill. Clearly the city officials had a terrific idea and didn't hold back. 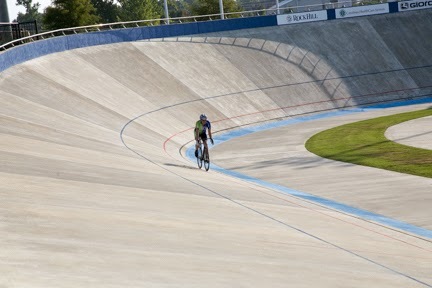 Although talk began back in 2002, the velodrome wasn't completed until 2012. It was built at the cost of $5 million with what I heard referred to as "innovative financing." No property tax or general fund money went toward the project. While five million may seem like a lot of money for biking, what a sound investment it was. 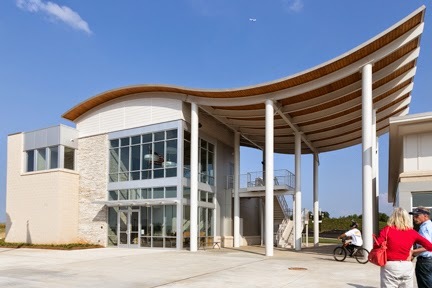 Not only can residents come and ride but the center draws numerous events and national and international championships. 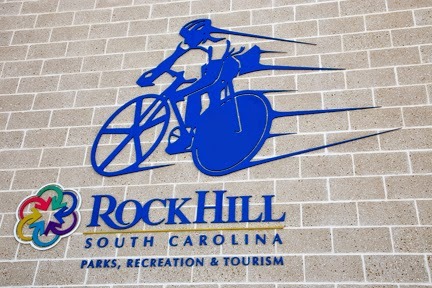 Those events bring overnight visitors who need lodging and dining in addition to giving Rock Hill a name on the map. "From our perspective, we believe investments in recreational amenities will serve as a catalyst for the overall development," said John Taylor, operations supervisor for the city's Parks, Recreation and Tourism Department. Thad Fischer, cycling coordinator for the velodrome, gave us a tour and explained the building process. "Once the workers started pouring concrete, it became a continuous, 7 day a week project. Twenty-four dedicated workers poured concrete by hand using painstaking detail to create a perfect 250-meter, 42-degreed banked oval track. They worked an entire day to pour one inch of concrete in 24 expanses. Over 200 tons of steel rebar were also used." The stadium is capable of hosting national and Olympic caliber events and can seat 800 spectators. The facility also has an overhead judging station. "Because it's a velodrome and has a steep embankment, it takes a certain level of confidence and skill to do it," said Thad. 'Cycling is a lifestyle... But the velodrome is not all about competition. ...It's a vehicle to take adults and children down a really good road." • "Kids on the Track": Designed for ages 6 through 14. Children learn track basics on the infield. Advanced riders move to the banked track. The class is free. • "Giordana Try the Track": Directed at the beginning cyclist. The staff introduces track-riding and safety. The program is a stepping stone to the more structured programs. It can accommodate two people per day and is free. • "Track Basics": This program is required for all cyclists who don't have extensive track-riding experience, or have taken the other programs. It discusses track rules and safe techniques. Experienced riders must also complete this 8-hour class, which costs $20. 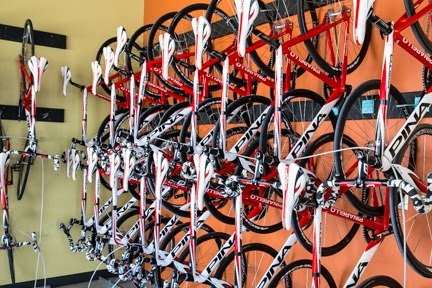 Bikes for the track's introductory programs will be provided. 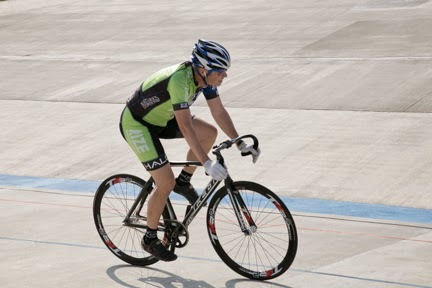 The bikes used on velodromes have no brakes and use a single, fixed rear gear. This helps increase speed while reducing weight. While I wish I were a good enough biker to try out the velodrome, I was happy to watch a lone cyclist put in some practice time. 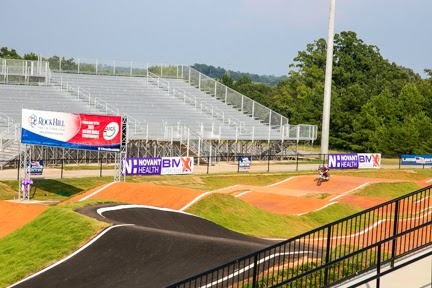 Next we moved on the Novant Health BMX/Supercross Track which had just opened after three years of construction and a cost of $7 million. I thought I was watching Evil Knievel flying on his motorcycle when I saw a young boy take off down the steep embankment and literally jettison himself and his bike over the track. Awesome! 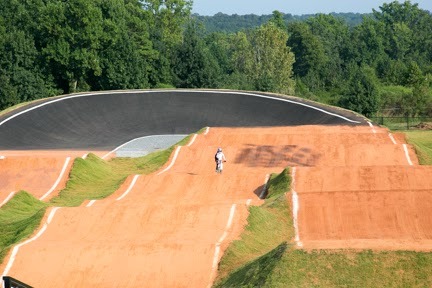 The facility features an 8-meter elite supercross start hill, 5-meter amateur start hill, pump track, instruction and community events, and programs for all ages and skill levels. Rock Hill has done it again, building the first Olympic-caliber BMX training facility open to the general public on the U. S. East Coast. Rock Hill, population 69,000, truly seems like a grand community. I think I would like living there. Watch my video of a BMX biker going down the Supercross start hill.